This passage of Scriptures brings a lot of comfort to me whenever I read it. Thank God that He loves us dearly and watch over us daily. He know all about us and what we are going through. Even the hairs on our head are numbered! God takes feed the sparrow and clothe the lilies. He is with us always and bid us fear not as we are of more value than many sparrows. May this wonderful knowledge strengthen our hearts each day, as we strive to live for our Lord and serve Him, through all the changing scenes in life. I was surprised to read that you were dressed like a boy for several years of your young life. Did that make you more anxious to wear girlie things when you could, or did you prefer to remain rather tomboyish by then? I also share your love for reading, but don't do it as much as I'd like. I loved learning a bit more about you, Nancie! Thanks so much for sharing. A very nice photo and an encouraging scripture - thank you! Such a lovely picture, and very encouraging scripture sweetie. Oh, I love how you displayed that verse. This verse has always been a great reminder of how dearly loved we are. That was one of the verses our preacher used this past Sunday! Wow :) Thanks for the blessing today! I love the picture verse you did today. Thanks for sharing. Very encouraging scripture....It's so easy in today's fast-paced world to feel like if we can't keep up, we're not important enough and that's a great reminder that's not the case in God's world. Nothing is ever too important than the other with Him. "God takes feed the sparrow and clothe the lilies. He is with us always and bid us fear not as we are of more value than many sparrows." Simply amazing. Who are we that God is mindful of us... yet He is still mindful of us. I loved your verse and beautiful photo. Now I want to go read your 6 things! God bless you for your encouragement and inspiration for this beautiful day. Happy WFW! What a cute and beautiful little bird, yet we are of more value than many of them. That is such a great way to remember this, especially on days we are feeling down or not quite so worthy. Blessings to you. Thanks for speaking to my heart with this verse. Thank God that He loves us dearly and watch over us daily. Daily... AMEN! Beautiful, Nancie! 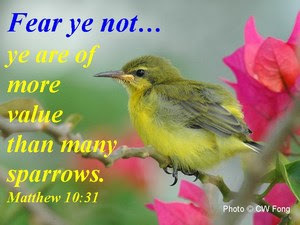 It makes me think of the song "His Eye is on the Sparrow"... a favorite of mine. I really like that! Great one dear heart! Hi Nancie - I just love meeting people in other countries. I will have to come back to further explore your blog. Beautiful photos! I love them all. You have a great talent for matching scripture with just the right photo. I just love this verse! It really highlights just how much God's creation is loved by Him. Thank you & happy WFW! Lovely photo and verse. Thanks for sharing. We are valuable to our Father! What a wonderful reminder today! I love this verse too. It is a great reminder of his love for us. Thanks for coming by. Your sweet comment is a Blessing. Have a great day tomorrow. Or is it today there? Love your scripture/photo. We are more important to HIM than the sparrow! Such a nice picture and a great word of encouragement. God loves and cares for us - blessed me day today. Thanks for sharing. Amazing photograph. These verses are so reassuring and comforting!! Hope your week has been blessed. Dear friends, thanks for stopping by and your encouragements. I am greatly encouraged by reading your blog too with all the lovely picture and encouraging Bible verses. May God continue to enable us to encourage one another as we share comforts and blessings from His Words!